This chart tracks relationship trouble via Facebook status updates, which show a spike of breakups in the spring. Journalist David McCandless scraped 10,000 status updates for words "break up" or "broken up"
(CNN) -- Worried about when you might get dumped? Facebook knows. That's according to a graphic making the rounds online that uses Facebook status updates to chart what time of year people are splitting up. 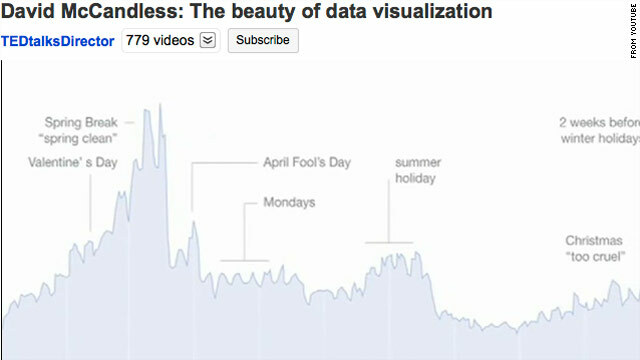 British journalist and graphic designer David McCandless, who specializes in showcasing data in visual ways, compiled the chart. He showed off the graphic at a TED conference last July in Oxford, England. In the talk, McCandless said he and a colleague scraped 10,000 Facebook status updates for the phrases "breakup" and "broken up." They found two big spikes on the calendar for breakups. The first was after Valentine's Day -- that holiday has a way of defining relationships, for better or worse -- and in the weeks leading up to spring break. Maybe spring fever makes people restless, or maybe college students just don't want to be tied down when they're partying in Cancun. And let's hear it for cheapskates. The other big romantically treacherous time, according to the graph, is about two weeks before Christmas -- presumably as people begin pricing gifts for their significant others. Mondays, as if they weren't bad enough, are the most likely day to break up. Summer and fall look like the safest seasons. And, possibly showing that some people's sense of humor is more twisted than others, there's a spike in breakups on April Fool's Day. What single day are you least likely to get a "Dear John (or Jane)" letter? "Christmas Day," McCandless said. "Who would do that?"